Greater sage-grouse (Centrocercus urophasianus, hereafter referred to as “sage-grouse”) are endemic to sagebrush (Artemisia spp.) ecosystems throughout Western North America. Populations of sage-grouse have declined in distribution and abundance across the range of the species (Schroeder and others, 2004; Knick and Connelly, 2011), largely as a result of human disruption of sagebrush communities (Knick and Connelly, 2011). The Bi-State Distinct Population Segment (DPS) represents sage-grouse populations that are geographically isolated and genetically distinct (Benedict and others, 2003; Oyler-McCance and others, 2005) and that are present at the extreme southwestern distribution of the sage-grouse range (Schroeder and others, 2004), straddling the border of California and Nevada. Subpopulations of sage-grouse in the DPS may be at increased risk of extirpation because of a substantial loss of sagebrush habitat and lack of connectivity (Oyler-McCance and others, 2005). Sage-grouse in the Bi-State DPS represent small, localized breeding populations distributed across 18,325 km2. The U.S. Fish and Wildlife Service currently (2014) is evaluating the Bi-State DPS as threatened or endangered under the Endangered Species Act of 1973, independent of other sage-grouse populations. This DPS was designated as a higher priority for listing than sage-grouse in other parts of the species’ range (U.S. Department of the Interior, 2010). Range-wide population analyses for sage-grouse have included portions of the Bi-State DPS (Sage and Columbian Sharp-tailed Grouse Technical Committee 2008; Garton and others, 2011). Although these analyses are informative, the underlying data only represent a portion of the DPS and are comprised of lek count observations only. A thorough examination of population dynamics and persistence that includes multiple subpopulations and represents the majority of the DPS is largely lacking. Furthermore, fundamental information on population growth rate (i.e., finite rate of change, λ) and specific demographic parameters that explain sources of variation in λ within different subpopulations would be valuable for making conservation and management decisions for this DPS. During 2003–12, agencies and universities collaborated to conduct extensive monitoring of sage-grouse populations within the Bi-State DPS. 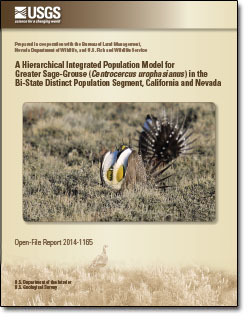 Data regarding lek attendance, movement, and survival of sage-grouse across multiple life stages were documented. Specifically, sage-grouse from nearly all subpopulations were marked and tracked across multiple seasons using radio-telemetry techniques. A hierarchical integrated population modeling (IPM) approach was used to derive demographic parameters for the Bi-State DPS using the large amount of data collected over a 10-year period. This modeling approach allows integration of multiple data sources to inform population growth rates and population vital rates for the Bi-State DPS overall, as well as for individual subpopulations. These models are more informative than other models because they integrate inputs of demographic data (for example, survival and fecundity rates) and survey data (for example, lek observations). The findings here will help characterize population growth rates within the Bi-State DPS. Coates, P.S., Halstead, B.J., Blomberg, E J., Brussee, B., Howe, K.B., Wiechman, L., Tebbenkamp, J., Reese, K.P., Gardner, S.C., and Casazza, M.L., 2014, A hierarchical integrated population model for greater sage-grouse (Centrocercus urophasianus) in the Bi-State Distinct Population Segment, California and Nevada: U.S. Geological Survey Open-File Report 2014-1165, 34 p., https://dx.doi.org/10.3133/ofr20141165.